FACE | AFRICA LEADING AT THE EUROPEAN PARLIAMENT! 09 Mar AFRICA LEADING AT THE EUROPEAN PARLIAMENT! Brussels, 9 March 2018 – There are “winners” and “losers” in the conservation of wildlife in Africa! H.E. the Ambassador of Zimbabwe proclaimed at the conference “Keep Calm and Let Africa Take the Lead. The EU-Africa Dialogue: Supporting communities in wildlife conservation” on 6 March 2018 at the European Parliament in Brussels. He stated that Southern African nations were amongst the “winners” with increasing national wildlife populations. At this conference, organised by MEP Karl-Heinz Florenz, President of the European Parliament’s Intergroup on “Biodiversity, Hunting, Countryside”, representatives of the wildlife management authorities, parliaments, embassies and non-governmental organisations from Zimbabwe, South Africa and Namibia explained why the EU must “Keep Calm and Let Africa Take the Lead” in decisions about the management and conservation of Africa’s wildlife. Ali Kaka, Vice-President of the International Union for Conservation of Nature (IUCN), the largest umbrella organisation for nature conservation organisations in the world, a national of Kenya, moderated the discussion and encouraged interventions and questions from the audience. 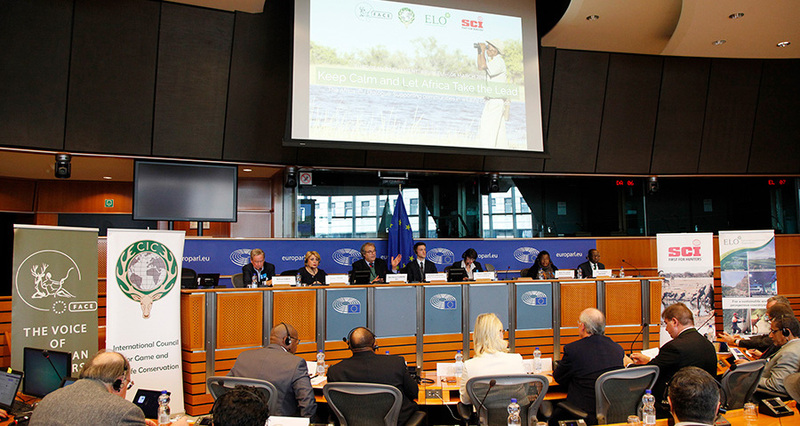 The panellists explained to an audience that included Members of the European Parliament, representatives from the European Commission and leaders in the hunting and sustainable use community, how hunting in Africa contributes significantly to wildlife conservation, habitat improvement and the fight against poaching and illegal trafficking. In particular, the speakers explained the importance of community-based conservation as the key to Africa’s success in bringing species populations back from decline while contributing vitally to the livelihoods of the communities. The panellists included Joanna Drake (Deputy Director-General in DG Environment, European Commission), Maxi Louis (NACSO, representing communities from Namibia), H.E. Prof. Kaire Mbuende (Ambassador of Namibia), H.E. Tadeous Chifamba (Ambassador of Zimbabwe), Joanne Yawitch (Chairperson of the South African National Parks), Arnaud Goessens (Wildlife Conservation Society) and Wilfried Pabst (landowner in Zimbabwe). The Minister of Environmental Affairs of South Africa, Dr Edna Molewa addressed the conference through a video message. Minister Molewa reiterated South Africa’s approach to wildlife management should benefit both wildlife and people. “South Africa is committed to promoting responsible hunting that is conducted in line with the applicable legislation” she said. Minister Molewa reported that trophy and meat hunters respectively contributed R1.9 and R8.6 billion – approx. between 129 and 584 million euro – to the economy of South Africa in the 2015-2016 hunting season. Hunting further contributes to food security in the form of healthy, free-range, lean protein of between 31.000 and 87.000 tonnes per annum. Joanna Drake underlined that it is a cornerstone to involve local communities, which is a key element of the EU Action Plan Against Wildlife Trafficking, and encouraged the organisations involved in sustainable use to continue their valued conservation work and to promote sustainable hunting. Prof. Kaire Mbuende expressed his concerns over some attempts to ban the import of trophies to the EU, which would have disastrous consequences, as 80% of Namibia’s wildlife revenue is coming from the hunting industry. Maxi Louis added that despite of the challenges Namibia is facing in terms of their wildlife management, such as drought, human-wildlife conflict, poaching and the issues of land use, Namibia has success stories, creating large connected landscapes, with proper governance and real benefit sharing. Tadeous Chifamba highlighted that one of the biggest threats to wildlife in Zimbabwe is poaching. He stressed the importance of sustainable hunting, as a counter measure, and as its revenue going back to the local communities, motivates communities to live with their wildlife in harmony. Willy Pabst, describing his success story in having created a wildlife paradise, clearly pointed out that trophy hunting was the foundation of his success as it was providing the necessary income for securing the thriving of the wildlife in his sanctuary. MEP Stefan Eck, Vice-President of the Animal Welfare Intergroup in the European Parliament, expressed his disapproval of trophy hunting, but at the same time he acknowledged that in order to safeguard a healthy population of wildlife the off-take of 1% of the population though trophy hunting could be an acceptable management tool. This could be the beginning of a constructive dialogue between trophy hunting opponents and trophy hunting supporters in the interest of conservation of wildlife. MEP Bendt Bendtsen, Vice-President of the Intergroup “Biodiversity, Hunting, Countryside”, and MEP Franz Obermayr expressed their appreciation for the important information received from the African delegates and stressed the necessity to repeat similar events periodically to hear the voice of Africa. MEP Annie Schreijer-Pierik, Vice-President of the Intergroup “Biodiversity, Hunting, Countryside”, gave important conclusions and closed the session. The message that the speakers and participants in the event delivered to the EU was clear. Africa’s wildlife management authorities and the leaders of conservation-related organisations in Southern Africa are successfully managing and conserving their wildlife through sustainable use methods, including hunting. Decision-makers in the EU should work with Africa’s leaders in order to continue, support, enhance, and replicate their success. The European Federation for Hunting and Conservation (FACE), the International Council for Game and Wildlife Conservation (CIC), the European Landowners’ Organization (ELO) and Safari Club International (SCI) had the pleasure to co-organise the event, and to give Africa and its wildlife conservation a stage and voice in Europe’s capital city, Brussels.